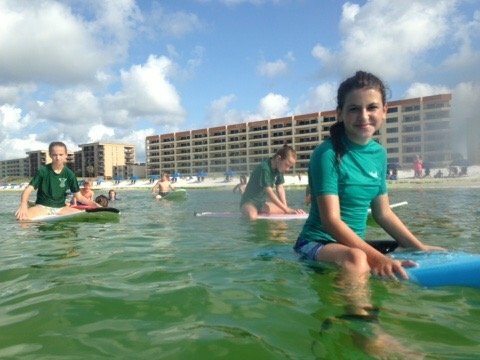 Surf lessons – $90 per hour. Lessons include board and wetsuit if needed. Instructors are usually members of Fluid’s Elite surf team, with many years experience teaching. Our motto is “To the Beach” and that is what you will be doing, riding waves to the beach. Surf practice – Every Saturday mornings once school is out, from 8-10 am, cost is FREE. Location is on Okaloosa Island, access #3. Call the surf report for further details, 850-244-0876. Everyone is invited, you must be able to swim, we have 3 or 4 extra boards if you need to borrow one, although you might have to share. Bring sunscreen and water. Volunteers are always needed!